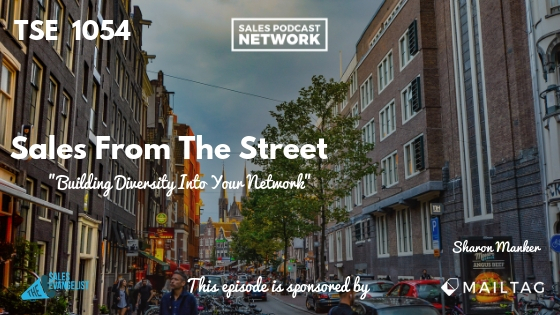 TSE 1054: Sales From The Street - "Building Diversity Into Your Network"
As you’re working to expand your reach and grow your network, recognize the importance of building diversity into your network so you’ll be better positioned to succeed in your industry. I met Sharon Manker at the Eastern Minority Supplier Development Council ROAR Conference, which connects minority-owned and women-owned businesses with Fortune 100 companies. Sharon has worked in supply chain for two decades, in both the for-profit and the nonprofit sectors, in utility and now in healthcare. In her words, she negotiates for a living. She also works to engage diverse suppliers in a woman-owned, veteran-owned, minority-owned system. Many small business owners lack the vehicle to connect with the right decision makers. They don’t know how to meet the people who actually influence the contracts. When they discover their limitation, they often observe that they just didn’t realize how it impacted their work. As a supply chain person, Sharon works to connect qualified suppliers to the businesses who need them. She also works to connect those same businesses with her business stakeholders. To that end, she attends events and even hosts events that allow people to connect and build relationships. The trick is to recognize that as you’re working to connect with the decision makers, there are people along the way who can help you do exactly that. When you aren’t able to attend these events, Sharon points to other opportunities to connect with people: chambers of commerce and councils, just to name two. You’ll be positioned to find corporate partners there. You’ll encounter people who are actively engaged and ready to increase their supplier diversity. Even if you attend these events and find out about developments that are 24 months away, future gains will happen. Put in the work now and build relationships now. Many corporations prioritize working with small businesses because they have committed to certain diversity goals, such as spending a certain amount of their operating expenses with diverse suppliers. In some states, in fact, this diversity is mandated. This demands a pool of Minority Business Enterprises, Veteran Business Enterprises, and LGBTQ enterprises that can help meet the needs of those businesses. It can’t be a last-minute effort, either. You don’t want to wait until you’re in an emergency situation to begin vetting partners. Those organizations must proactively work to find the best option in every category to provide the product or service they need. Some corporations connect with small businesses simply because they value giving back to entrepreneurs and small businesses. If you’re an entrepreneur or a seller listening to this, find groups like this to connect with, because if you can land a large contract, you can eat pretty well for a while. Create a strategic plan for your business. In your case, your plan for success is that failure is not an option. Instead, when you fail, you learn a lesson, and you repeat that until you get to a successful outcome. You can’t give up. You must stay positive. There won’t always be immediate opportunities, but building a network of resources or opportunities provides some security. 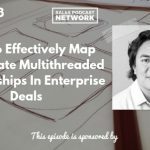 Then, if you don’t have a resource or an opportunity for those organizations, you could always help connect them with another partner that you’ve met and added to your network. We’ve talked recently about the need to focus on a champion rather than only focusing on the decision maker. Your network will help you accomplish that. You may bypass a champion on your way to connecting with a CEO, but the champion can be a much quicker connection. You can build a relationship with him more quickly, and then he can help you get to the CEO. When you’re building relationships, be mindful of your communications. Some people are very aggressive in their approach, but they often overlook all the other restraints that these decision makers are facing. They want to do a deal now, but they aren’t mindful of the other projects these professionals are working on. There are hierarchies of communication in every organization. There are also barriers to entry. Your champions can’t advocate for you if you’re perceived as aggressive or pushy. The vetting process may take weeks, and you must be willing to exercise patience. You don’t know about all the things that the organization is working on. Be strategic. Recognize the structure in each organization. People will notice the way you communicate. When your network does call on you for your product or service, make sure you are ready and able to give your brief, to-the-point presentation. Make sure you’re being active so you’ll stay positioned to meet other professionals. Make sure you’re open and willing and teachable. Even if you aren’t a minority, realize that if 51 percent of the company ownership is minority, that classifies as a minority-owned business. You can connect with Sharon on LinkedIn where she shares tremendous amounts of information about supply chain.